The Army Corps of Engineers held the first of many public meetings to discuss Lake Okeechobee water releases. The Corps wants your input on how the new plan get input on what you would liked changed. 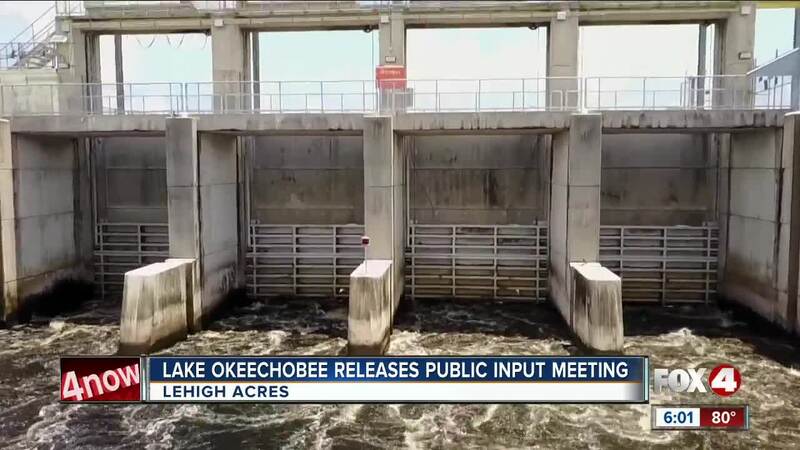 LEE COUNTY, Fla. -- The Army Corps of Engineers held the first of many public input meetings to discuss the future of Lake Okeechobee water releases. “Our primary purpose is to listen to people that have concerns or thoughts on how we manage water on Lake Okeechobee,” said John Campbell, U.S. Army Corps of Engineers, Jacksonville District. The Army Corps plan is to replace the more than a decade old, 2008 Lake Okeechobee Release Schedule (LORS). LORS was intended to be revisited when the Herbert Hoover Dike and two Comprehensive Everglades Restoration Projects (CERP), C-43 & C-44, were complete. The new proposal is called Lake Okeechobee System Operating Manual (LOSOM). It was a full house at the meeting that was held at Lee County Mosquito Control in Lehigh Acres. Scientists, elected officials, environmentalists, and concerned citizens filled the room. “Public health really needs to be a top priority especially with all the airborne toxins that have come out of the algae blooms and releases,” said volunteer Holly Rauen, Calusa Waterkeeper. Many echoed saying public health was a top concern. “The reason I am still here is because I have some hope that something will happen right now that I’m not going to be poisoned this summer, like I was last summer," said Cheryl Anderson, Cape Coral. The Army Corps of Engineers says this will be a four year process with meetings in February and planning workshops in May and August of 2019. In the four years it will be reviewing Lake Okeechobee operations and finding results to the operational plan by not building any new infrastructure. “We don’t need two years of public comment on something that everyone agrees on that we need to get this done sooner rather than later,” said John Cassani, Calusa Waterkeeper. Tuesday's meeting comes a day after Congressman Brian Mast announced his proposed bill to hold the Army Corps of Engineers accountable for releases. “The bottom line is this: if someone’s health is at risk, then they need to be notified. This bill will require the Army Corps to take accountability for their life-threatening actions and ensure that people know the dangers of coming into contact with toxic water,” said Congressman Brian Mast, the 18th District of Florida. Click here for all the scheduled meetings. The Army Corps is accepting comments through email until March 31st.